Parks and squares seem to be one of those things that have got better in the last few years. 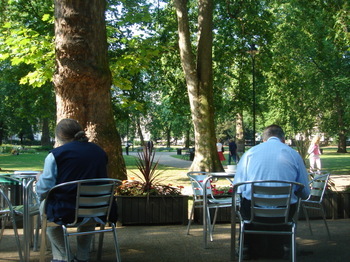 Russell Square got a refurb a while ago and they built a very nice cafe building which is a perfect place to sit in the summer before heading off to work. The chips instantly reminded me of this Tom Dixon extruded lamp-shadey thing we got once. Which got me a in a frame of mind for strange analogies. Like that egg - doesn't it sort of look like a sun with angel wings or the grill and front bumpers off a classic car (though in Toy Town colours)? Nothing occurs for the beans and bacon, but they were delicious. 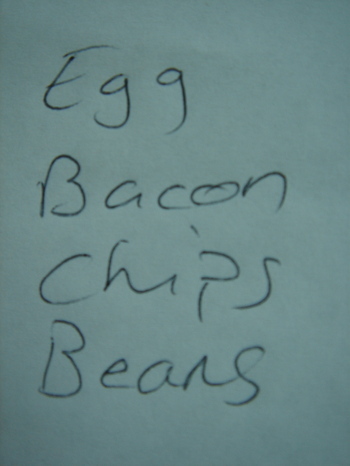 I think this is the only receipt or chitty I've ever had with all the things in the right order. Splendid. 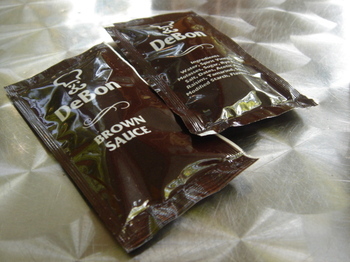 Slight disappointment with the sauce, I can't really approve of sachets over bottles but I can understand that their al fresco setting changes the priorities. Not many people'll nick a sauce bottle from a cafe, but, if you're in a park and you've got a sauceless sausage roll in your picnic hamper I can see you being tempted. And this it why you're here really. The grub's alright here, though a bit pricey, if you're sitting inside it's just another modernish, OKish cafe. But if it's a nice day and you can sit outside this place is perfect. 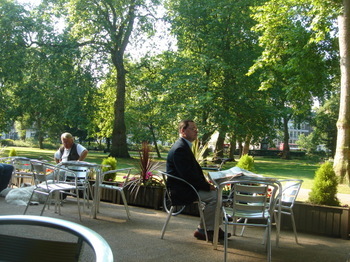 Starting your day in one of London's beautiful sqaures, watching the commuters pass (or decide to hang it all and have a last coffee before work), enjoying a respectable fry-up, mulling over things in your head; what could be better? Is this a NORMAL??? 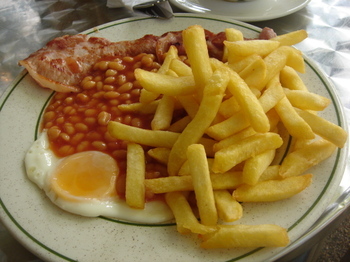 English breakfast? OMG - how funny - but I am an Earl Grey Drinker with a spot of cream. Have a great day and thanks for the lovely pics of everywhere! I don't agree with your comments on the prices, for central London its good. You are oviously used to the suburbs. That's for the interior I found it bright and up to date. I particularly like the fact that it is run by an Italian family who know their coffee and not a mass market chain. used to the suburbs? have you seen the rest of the site? I must go to this place, it looks lovely. 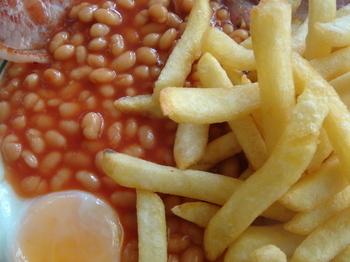 Btw, your blog ALWAYS makes me hungry. 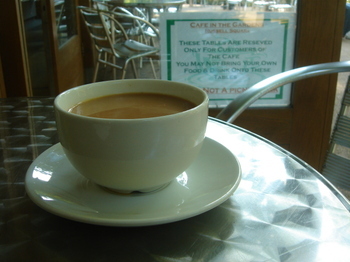 And my top tip is the Hope Workers Cafe, 111 Holloway Road, opposite the (what used to be) North London Uni architecture school. I have nothing but good memories of that place. 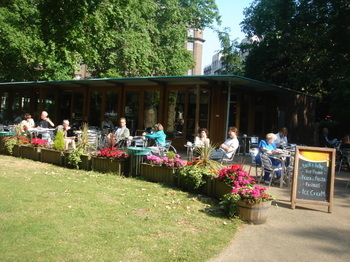 my boyfriend and i had a lovely breakfast at this place one sunny summer morning. brought back nice memories for me. I enjoy eating here. I went here in 1989,1990, 2006, 2007 and I will again this year during my May trip to England. I stay around the corner at the Tavistock Hotel, as the Imperial Hotel has become a bit too pricey for me. That is what I call a breakfast it looks delicious.